One morning, I wasn't feeling well. I experienced moderate to severe abdominal, I thought it was just the usual hyperacidity so I took Kremil S and ate sky flakes but render no relief. That evening, we were at the emergency dept of Chinese General Hospital. I was given an Omeprazole and Plasil through my veins provided immediate but temporary relief. Not too long, I was discharged and slept well that night. April 23, (2 days from now I am celebrating 1 year post surgery). The next morning, I experienced body malaise (weakness) and lost of appetite. I cried because of severe abdominal pain near the navel growing sharper down the right and left abdomen. I did not know it's ruptured appendicitis. At the hospital, skilled and friendly staff attended my needs. They checked if I'm pregnant so they know what meds to give. I was hooked to an IV fluid. Blood tests, pregnancy test, urine test were done. Medical, Surgical and even OB-Gyne doctors came to see me. I was also sent for abdominal X-ray. Blood tests reveals increase in WBC, an indication of infection. Blood pressure started to rise, from the usual 100/70 it went to 130/90. They call it peritonitis. The abdominal pain grew stronger. 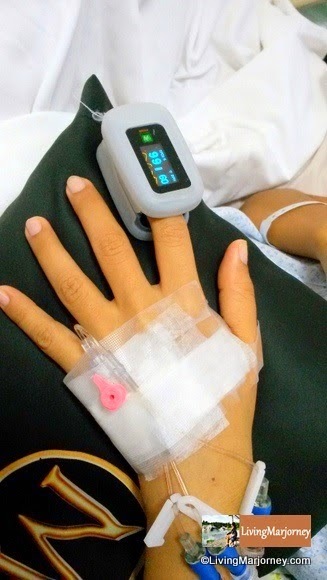 I was vomiting, hyperventilating, temperature rises to 38C. Through ultrasound, they found out dilated large intestines. I was advised not to eat nor given drinking water for 48 hours so visualization of the bladder was a bit difficult. In the afternoon, I was sent again to the Ultrasound department. The examination revealed fluid on right lower abdomen. I heard words like "surgical abdomen". 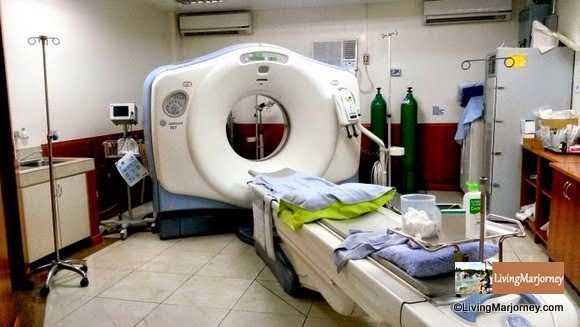 The doctors advised to do an emergency abdominal CT Scan and bought me to De Los Santos Hospital via Aeromed ambulance. We had to wait the next day though for the official result but Dr. Agustin, my surgeon wanted to see the plates so they requested a copy early Friday morning. My surgeon and radiologist at UERM read the CT scan and confirmed enlarged appendix and inflamed bowel. The family was anxious about the dilated intestines. I was afraid of surgery. Dr. Agustin explained two possible surgical procedures, first is the laparoscopic apppendectomy which uses a camera, patient is under general anesthesia and it's more expensive than traditional appendectomy. Second is open appendectomy, a larger cut (infraumbilical midline incision) to see the intestines and other internal organs such as the ovary and uterus. So, I had abdominal surgery to remove the ruptured appendix and treat the inflamed large intestines. What's next? I was recuperating at my room and heard the nurse we need to pay the bill so we will be given the next scheduled medication. Finally after the storm, we are ready to go home but wait, there's more to accomplish... the hospital bill and doctor's professional fees. It was a whooping P150,000 from operating room expenses to medication. I was worried then because we don't have PhilHealth nor HMO or MediCard. That means, we have to pay everything in cold cash before discharge. We have to withdraw our savings from the bank. I feel sorry for the money spent but thankful these money saved my life. I'm just thankful we have enough savings to cover these emergency expenses, what if none? After the incident, my husband an sit-down and talk about our remaining savings, did some accounting and started reviving our insurances. We are also considering getting MediCard. I realized the value of getting MediCard where members have access to more than 40,000 accredited doctors, specialists and dentists in almost 1,000 accredited hospitals and clinics nationwide. MediCard offers a comprehensive healthcare coverage to its members from hospitalization, outpatient, preventive, emergency, member’s financial assistance and dental services. Aside from hospital bill due to surgery, I also went to another facility for the abdominal CT scan, there we need cash to pay the procedure. If only I have MediCard, maybe we don't have to worry the urgent need for cash and just present the card. Health is Wealth. But sometimes, we have no control over medical problems. With many factors, like change in weather we easily got sick so the best thing we can do is prepare for ourselves and for our loved ones. Find out more about MediCard, visit their FB Page. I know there's a lot to know more about MediCard and its benefits. Soon, I will be more knowledgeable about it and will share to you why there's a need for MediCard. How about you, do you own one? Are you and your family ready for emergencies like this? 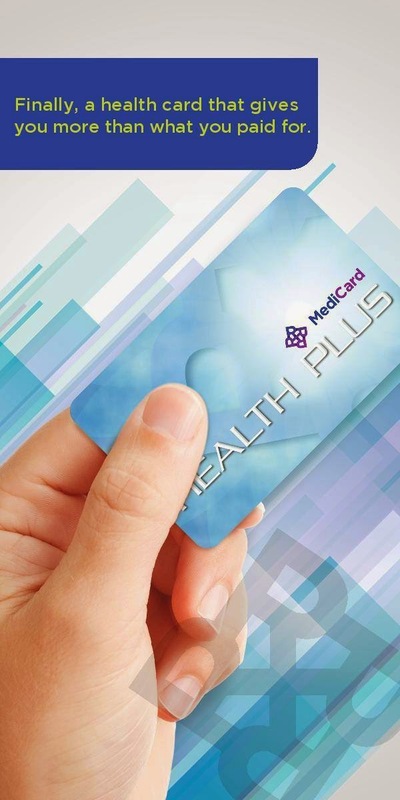 What are your thoughts about MediCard or HMO? Can u help me? How can i apply to be a member of MediCard.